From beginning to end, all of our drawings are done in-house utilizing the latest technologies in 3D, 2D and manufacturing. PBT has the ability to design and build large and small parts, whether fiberglass or metal to fit your needs. With the boating industry getting more and more digitalized, we are up to speed with the ever growing demands for 3D design work. 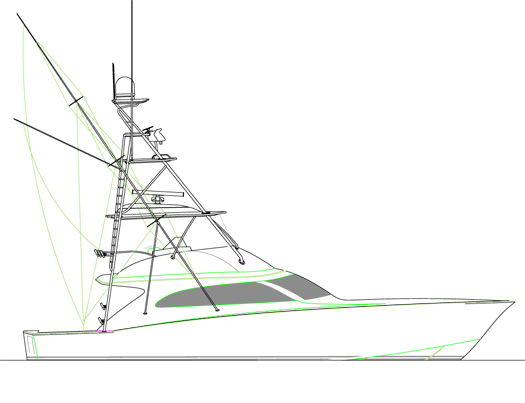 When a tower project is slated for production, PBT starts off by measuring your current yacht (new or used) with extremely detailed measurements that are critical to the development of your tower or hardtop frame. This ensures that we are able to recreate your bridge/house into our design software for tower accuracy and shaping. Next we begin designing your bridge and then inputting your new dimensions into the CAD software to create your tower/hardtop frame. Based on these drawings, we will be able to supply you with very detail drawings for not only the metal work, but all the fiberglass parts as well. All of these guarantees ensure that the tower building process is accurate and runs smoothly during the installation process.